Well I finally sat down to type out our 5th grade curriculum choices. It may be February, but better late than never, right? Confession: I’m not as organized this year as I’d like to be. I feel like I’m flying by the seat of my pants and I don’t like it one bit. One of my goals for next year is to spend my summer more wisely – with more planning and prep. Whew! But at least we’re making progress this year. Curly works on this with Tiger (3rd grade). And let’s be honest, she does most of the work, but he’s learning too! We do this all together for our group school time. The little ones use the Beginner pages, but I love that we all study the same Scriptures together. We are on the last level of Right Start Math! I’m so sad that we are almost done. This year we’re finishing up and starting to look ahead toward Pre-Algebra next year. But the best thing about this level? It’s largely independent. I was worried that Curly was not solid enough on some concepts related to fractions and division so I added this into our math plans to make sure that we have all our bases covered. This is done independently for extra practice and reinforcement. This is our main grammar text this year and Curly does most of the work independently. Independently – how wonderful! We’ll try to cover one book a semester (which isn’t exactly happening…..), but we’ll keep moving forward and maybe finish both by the end of summer. We might do this program over the summer as well since I have it one hand. Curly loves writing so I want to keep her engaged! We will work through this book together before we begin more formal literature analysis next year in 5th grade. We’re still doing handwriting practice! We still need it rather badly, ahem…My kids do not have the greatest handwriting and I think they get that from me. We will work on this logic book together, covering about two chapters per week. And then we may go back through the book a second time to make sure we understand the various fallacies taught in the book. Curly wanted a more in-depth study of Spanish and this was one of the few middle-school appropriate choices that I could find. This program has been fairly independent and I’m super thankful for the teacher’s guide. I’m struggling to remember my high school Spanish! This one is tough! We work on this program together during our group school time. My kids watch these videos during lunch. This is our main history curriculum. Curly will be working at the dialectic level and reading many of the book choices on her own. This is our read aloud during group school time. I’ll supplement with a few extra anatomy books throughout the year. We’ll be studying some topics on biology, botany, ecosystems, energy, and electricity. We’re working to finish this but we started something new…. I was ready for Curly to work more independently on science this year so she’s trying out this program with the online portion. She watches the videos and outlines her weekly reading. So far, so good! In the fall, Curly took Chemistry through Landry Academy. They use Christian Kids Explore Chemistry as a spine. Then Landry Academy suddenly went under and left all teachers and parents scrambling. It was not fun, y’all. I still don’t know exactly what happened, but I’m incredibly sad because we have loved our classes with Landry. So we don’t have an online class for spring. I’ll have to find something new for next year. I’ll be adding lots of great books to our curriculum line-up as well. And I hope some art and music studies can be added in somewhere……and of course swimming…lots and lots of swimming with swim team practice! 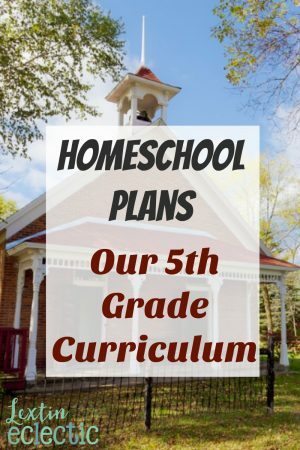 You can also see last year’s curriculum choices and read about how 4th grade became a year with more independent work. So, what grades are you teaching this year? Have your curriculum plan worked out so far? Hi Lexi, I see you are using Hake Grammar. How do you like this so far? I haven’t seen a whole lot of reviews on this grammar. This is one of my picks for 2018. I really thought we would like it because it is fairly independent. However, I’m not sure my daughter retained much of it. She kept making the same mistakes lesson after lesson. I don’t think very much of it stuck with her. I was actually pretty disappointed. I don’t think it’s quite how she learns. So I’m waiting to see the new middle school grammar from the Well Trained Mind. I might try that next year instead. I don’t think Hake was a good fit here.